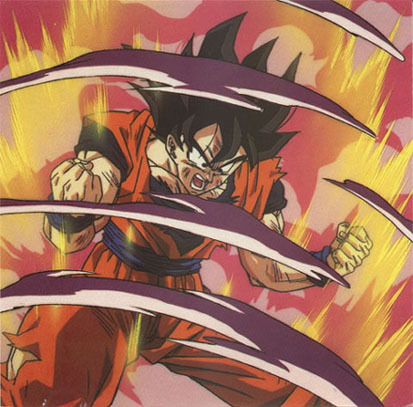 As everyone knows Goku is the hero of Dragon Ball Z. Goku is the second son of Bardock and is Raditz's younger brother. After Goku died in the fight against Raditz, Goku traveled down Snake Way to receive training from Kaiosama. Goku needed to get stronger in order to help everyone fight Vegeta and Nappa in a year. Goku finally reached Kaiosama at the end of the treacherous Snake Way. Goku learned the Kao Kien and Genki Dama from Kaiosama. Goku was wished back to life to fight, but arrived a bit late. Goku arrives just in time to save his son Gohan. Goku fought and defeated Nappa. Then Goku fought Vegeta. After Vegeta was defeated Goku rested, then went to Namek to help Kuririn and Gohan who were in trouble, because of the evil Freezer. Goku gets stronger and defeats the Ginyu Force. Goku becomes a Super Saiya-jin when fighting Freezer. After turning into a Super Saiya-jin, Goku avenges the Saiya-jins by defeating Freezer. But Freezer doesn't die until Mirai Trunks kills him. Goku also fights Cell, Buu, Bebi, Super Android 17, and the Evil Shenron Dragons. Goku's wife is Chi Chi. Their sons are Gohan and Goten.